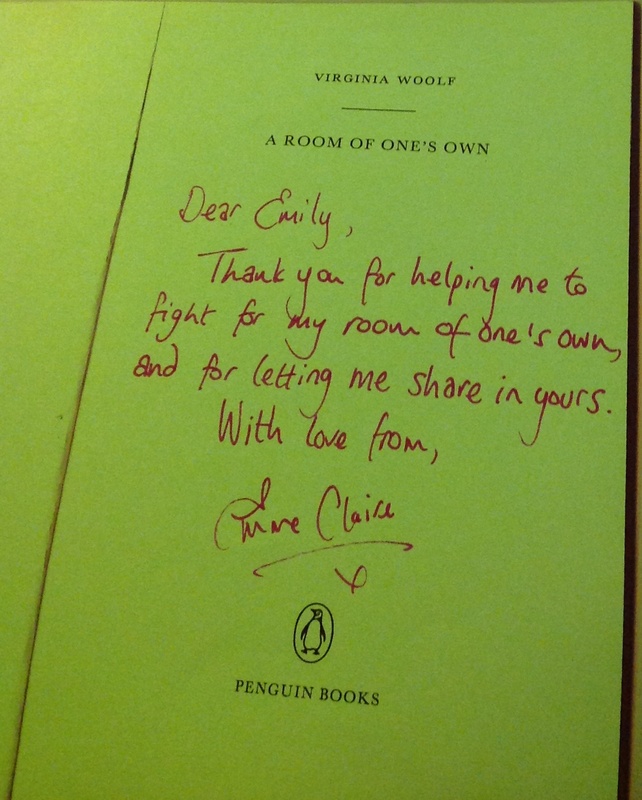 My gift for you, Emily, is A Room of One’s Own by Virginia Woolf – a book to which I have returned so many times during my quest to find a literal and psychological writing space. When I first read this extended essay on women and creativity in my college bedroom, we hadn’t yet met. The very fact that I was studying in Cambridge was evidence, perhaps, that the world had begun to listen to Woolf’s argument that women should receive the same access to education as men. Her words particularly resonated, since I read them from the other side of doors that had kept her locked out. I don’t think I’d admitted to anyone that I wanted to become a writer myself but when the opportunity arose to run the college literary society, I jumped at the chance. Cambridge introduced me to some brilliant and kind academics, to some very dear friends, and to many varied and wonderful books. But it was a world still relatively unused to northern state school educated women, so Ruben’s observation had been astute. I am profoundly grateful for the room I found during my time at Cambridge, but it wasn’t quite yet a room of one’s own. I re-read the essay a few years after graduation, when I was by then trying to forge my way as a writer. In order to work on my first novel, I slept on a friend’s floor, shared a bunk bed with a flatmate, and lived as a warden in a raucous halls of residence. Woolf’s argument that ‘A woman must have money and a room of her own if she is to write fiction’ had taken on, for me, a pressing significance. Although I was still struggling to find a literal room of one’s own, I had by then found a figurative one in my friendship with you. In you, I discovered someone else who was also trying to carve out enough time and money and space to write, someone else who shared the conviction that it was worth the fight. Most recently, I re-read A Room of One’s Own in the study in my backyard – my very own creative refuge. You have your own study now too. We have sat side-by-side at both of our desks, writing together about friendships between literary women. In this way, you have given me a gift that perhaps exceeds even Woolf’s hopes for the female writers who would follow her. With your help, I have been lucky enough to find not only a room of one’s own, but also a room to share. What a lovely post — with a perfect book at its heart. Thanks ksaelliott and theresakishkan. We’re glad you enjoyed the post – and Woolf’s book, of course.